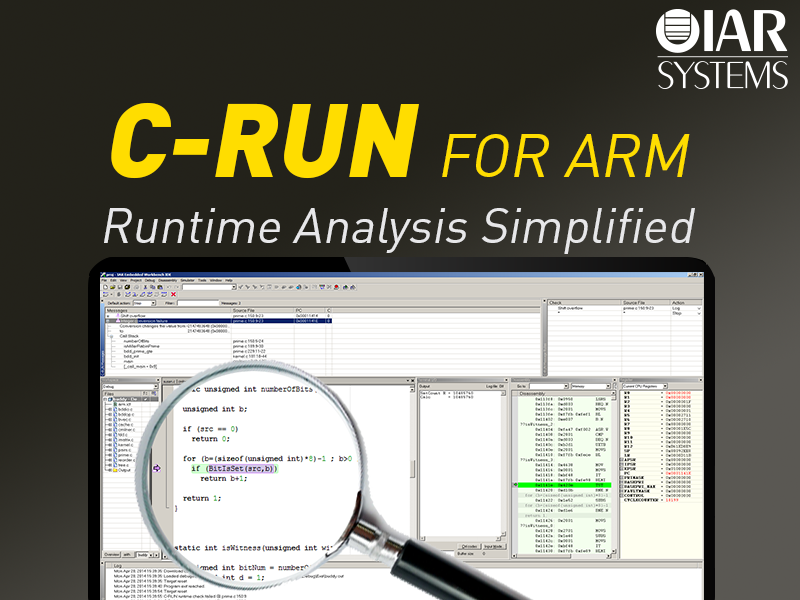 Uppsala, Sweden—May 19, 2014—Today, IAR Systems® proudly announces that its runtime analysis product C-RUN™ is available as an add-on to the world-leading development toolchain IAR Embedded Workbench® for ARM®. Integrated with the toolchain, C-RUN offers each developer access to runtime analysis that brings powerful functionality and is easy to use. C-RUN is a brand new product from IAR Systems that performs runtime analysis by monitoring application execution directly within IAR Embedded Workbench. The tight integration with the toolchain supports the full cycle of implementation, testing and debugging. C-RUN for ARM has several powerful features such as bounds checking to ensure accesses to arrays and other objects are within boundaries, different overflow and arithmetic checks, as well as a comprehensive heap checker. Flexible settings enable developers to customize analysis functionality according to specific needs. IAR Embedded Workbench for ARM. To read more about and explore C-RUN for ARM, visit www.iar.com/crun_arm.